-----Driving in Seattle is a nightmare. Somehow, the concept of advance planning left highway designers 'clueless in Seattle.' Why, it is so bad that Boeing even packed off its corporate headquarters to Chicago - the commute time, from SeaTac, is faster to the Loop than to The Needle. -----From way down in Utah, we had to do some advance planning, since Seattle did not. 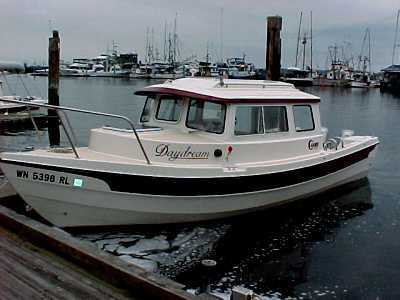 We hoped to go north of Seattle to Whidbey Island to get some upgrading of Halcyon by Les, at EQ Harbor. -----"Easy," I announced confidently. "We head northerly through Hanksville, continue through Sunbeam, cross the border at Sweetgrass …" My finger was following a snake trail northerly across the map and my voice was beginning to quaver. " … bear leftish at Stand Off, go over Crowsnest Pass to Kamloops …" Now my eyes were misting and my voice was cracking. " … drop south through Chilliwack, recross at Sumas … and …" I whispered the finale. "…we're there." I collapsed into the seat. -----El poured me another glass of sherry. "Good job, Navigator. 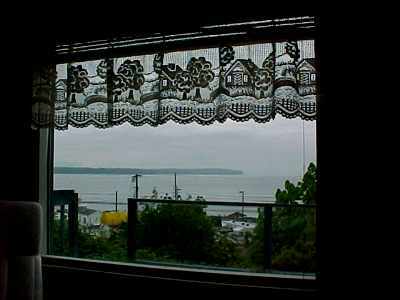 You missed Seattle entirely, but also the rest of 2003." -----"Let's bite the bullet," El said in her upbeat way. Her finger traced a diagonal from Page, AZ to Seattle. "Freeway all the way. One night in northern Utah, next night in Oregon, and then, on a Sunday afternoon while everyone is watching the ball game on TV, we roll through the empty freeways of Seattle and park that night on Whidbey Island." That's exactly what we did. 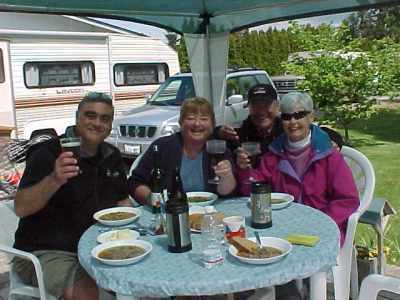 -----On Whidbey Island we met Les. Les has a quiet way and a twinkle in his eye. 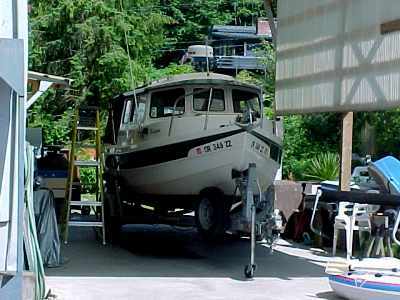 Open up the subject about boats … any subject dealing with boats … and the twinkle bursts with excitement. Les loves boats. Anything to do with boats. He gets a far away look as he talks about dreams of cruising the South Pacific. The intricacies of a Honda engine require a bit more of a squint. The wrinkles in the corner of his eyes dance with joy as he describes the virtues of trim tabs. He frowns a little when he starts describing Peukert's Equation. 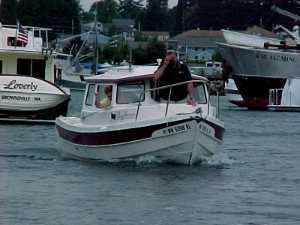 In his quiet, unassuming way, he is a walking encyclopedia of boating. We visualize crossing the Pacific with Les, miles sliding under the hull, learning from this master teacher, until we fetch up, in what seems only a week, on Fiji. 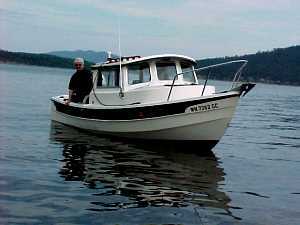 -----The "boat doctor" has some great ideas to upgrade Halcyon into an even better cruising boat, so she goes into his good hands for an electrical improvement, new trim tabs, and a Honda servicing. -----While Halcyon is being pampered, we have some time to do some thinking. "Got the whole summer in front of us," I began. 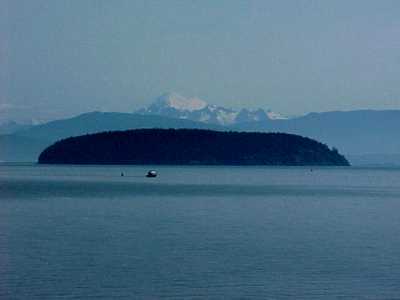 "Lots of water around here - all Puget Sound and the Straits of Georgia … San Juan and Gulf Islands … some of the best cruising ground in the West… quiet sunsets, sundowners, sunny beaches …"
-----"And all the Inside Passage and Alaska," El counters. "Wilderness, bears, whales, glaciers … Why not head north first, and cruise the Islands in the fall?" -----"Well," says the conservative one, "what about weather? Maybe it's too early in June, and we should wait for mid-summer. There are some big open water stretches up there, and exposure to North Pacific storms." -----"Let's ask Dusty … he knows that country," El decides. So we did. -----Dusty is quite a guy. To even précis his life would fill a book. So, let's leave it that he's quite a guy - and, in addition, he and his wife somehow found time to launch Les into this world. -----Dusty gets to the point as swiftly and precisely as a carrier pilot lands the deck (yes, he was one). "Go early," he said. "You have two advantages - long days and a better chance for good weather. You don't want to take a chance with those early fall storms. They can toss a carrier." (Yes, he was captain of a carrier). "There are some good ships on the bottom of Alaskan Straits whose skippers misjudged the severity of a September front." (Right, he also has been skipper of small boats in Alaska). -----Our timing was set - we head north when Halcyon is ready. So, what to do in the interim? "No problem," I chirped. "There are about 70K waypoints and routes still to plot before departure." I had been patiently plotting Alaska waypoints since last November, when we were temporarily grounded in Kentucky while El's leg healed from her slip on that slimy boat ramp on the Tennessee River. Southeast Alaska offers a reported 15,500 miles of shoreline choices. We wonder, who counts those miles? We have visions of a gnome in an unheated dark basement of the Federal Building in Juneau patiently tracing … and tracing … and tracing. -----'Southeast,' as locals call it, is officially the Alexander Archipelago. It is a maze of islands, channels, straits, rocks, passages, and choices. Consequently, we can see with a glance at the chart that there are hundreds of possible routes and anchorages. For the indecisive, it must be a nightmare. 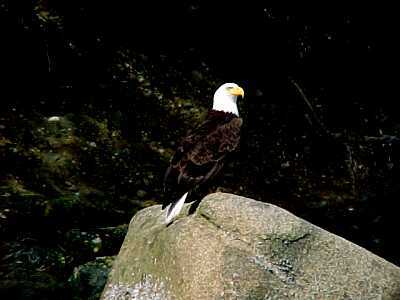 -----We, not so fondly, remember an indecisive boatman who couldn't decide which side to pass a rock in the middle of a rapid on the Middle Fork of the Salmon in Idaho - he smacked it amidships. After gatheringg up the pieces and the people, we spent the afternoon on a sandbar patching his boat while gear and folks dried out. The boatman sat taking deep draughts from his bottle staring at the river. On floating craft, one must be able to make decisions - fast. -----Now we had a choice. My suggestion of sitting around plotting waypoints was met by a distinct frown from El. "Boring," came the response from The Admiral. -----"OK," I feebly answered. "Let's go to Fairhaven. You enjoy that town." -----"Great idea!" El lit up. "Ah, the bookstore and the Colophon. Café Latté and a good read, while you plot our waypoints." So, now do you see why I am the Captain and El is the Admiral? 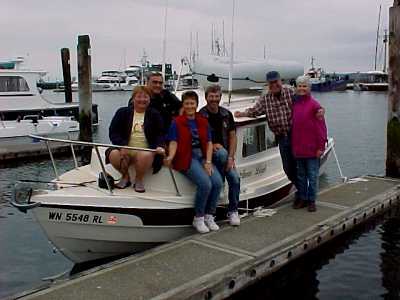 -----We had hung out in Fairhaven on other trips north. Our last time there was in December 1999. We had been kicking around Alaska outports for a few winter weeks, with Christmas in Sitka. The Doomsayers, however, were predicting chaos with the arrival of the new Millennium. All computers would fry since '00 would be read as 1900 and we would have to relive last century again, and who wanted a rerun on that one? Therefore, we figured we should be ashore for the Y2K disaster, or the Alaska ferry Columbia would, at the stroke of midnight, start vectoring for Yokohama. We arrived in Bellingham the evening of December 31, 1999 and were safely tucked into a B&B in Fairhaven when the non-disaster occurred. -----Now, with Halcyon cavorting with Les, we visited the bookstore and drank good Seattle coffee. In the evenings, while I plotted waypoints, El read Rowing to Latitude, by Jill Fredston. "What a great read," El said with eyes flashing. "This young lady and her husband have rowed a shell more than twenty thousand miles in the North." -----"Don't get any ideas, El." I eyed her cautiously, knowing that tone of voice. ------"No way," she said with a grin - "and give up our Wallas stove and comfy V-berth? We've been there and now we deserve engines." We have paddled, rowed, and sailed our thousands of miles, also. Some in the North, some in the South, and mostly in the Southwest. "Sure glad we did it when we could, though - and Jill is a marvelous writer. It's great to 'do it' with her." -----In the evenings, we tuned into the Internet and the C-Dory websites. There was a message for us. Pat and Patty invited us up to Birch Bay for a visit, so we headed up the coast a few miles to meet them. 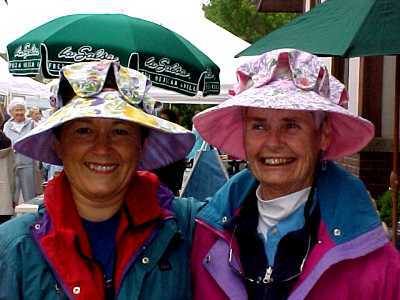 -----"Welcome," Patty said, with a smile that stretches from North Bend to Seattle. What a fine visit we had. Pat is not only the brewer of fine beer, but a marvelous cook as well. We swapped tales over chow, like long-lost relatives. 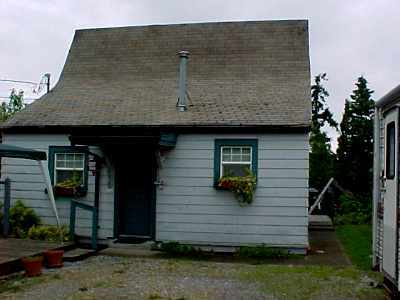 -----On departure, they said, "We're not using this summer house now. Stay here while Les works on your boat." So we did, living in our camper in their driveway. We really enjoyed their living room in the evenings. After the evening news on TV, El curled up in a comfy chair with her books and I had a table for the laptop, and our cruising guides. 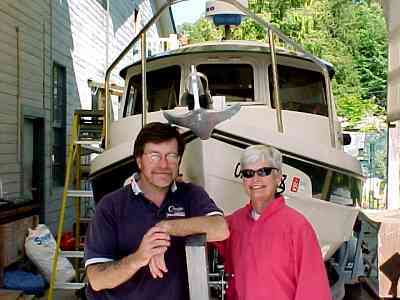 -----The Internet C-Dory site also introduced us to David and Kate, boat owners who have a home on Guemes Island. They invited us to check out the Saturday Farmer's Market in Anacortes. 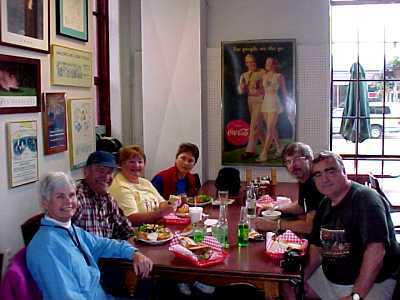 Pat and Patty came down a little later on their Daydream and we all shared a lunch together at Gere-Deli. -----There is something special about the ritual of 'breaking' bread together. Perhaps the rite awakens primordial feelings from sharing a leg o' Mastodon back in the Paleolithic. We had a great time together. Pat and Patty had to head back north with Daydream, but David and Kate invited us over to their home on Guemes Island. We have been intrigued with island life in the San Juans and appreciated the invite to share an island afternoon. The six of us headed back to the marina together, chatting excitedly like teenagers on a date. -----We shared a pleasant afternoon and dinner with David and Kate, talking boats, island life, and about their busy and interesting lives. -----The next day, we heard from Les that his work on Halcyon was almost complete. We headed to Cornet Bay to start reading about trim tabs and amp hours. -----There is an entire field of engineering we hadn't even heard about -propulsion technology. If we thought the equations for electrical systems were complicated, we were dumfounded by those in propulsion. There are some things in life we just accept - like turning on a TV and not having the faintest idea how it works. Propellers fit the same category. Swedes had evolved a new prop made out of wondrous composition materials. It is a four-blade and, when the inevitable rock is clipped, you can easily replace a blade rather than the entire prop. Also, for the aficionados of tech, with a twist of an allen wrench, you can change the pitch. We decided to put on the high tech props for our trip north so wanted to give them a sea trial and see how they felt. -----Cornet Bay is right beside Deception Pass. There you have a delightful choice - head through the Pass to Rosario Strait, or turn to port and head into Skagit Bay. -----"Lots of water out there, El. We're back at the Candy Counter (our reference to the many exciting choices in the boating life)," I said, peering into the computer and looking at the charts of the San Juan Islands. The tan, blue, and white on the computer screen was pockmarked with black dots and streaked with lines - the waypoints and routes I had been plotting for months. -----"If our plan is to test out the props, we should do it under our normal cruising conditions, right?" El asked with that twinkle in her eyes that I know precedes an 'ah hah!' conclusion. -----"Yes," I answered with the same hesitation a mouse must have before nibbling the cheese. "So let's head through the pass, do a little bouncing, and cruise Rosario." I was trying to get in my thought before El snapped the trap. "There's enough wind today to give us interesting conditions." -----"Great idea!" El was, in a former incarnation, a First Grade teacher. She knows the power of positive reinforcement. "If we time it right, we can then have shrimp for lunch in Anacortes." Snap! -----We headed out of Cornet Bay and hooked a hard turn to starboard. 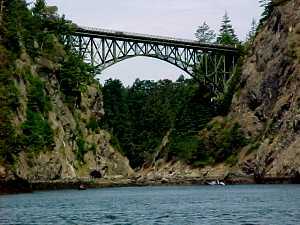 The bow lifted to the short waves of the tidal run as we entered Deception Pass. A light skim of stratus smeared the blue sky like a skim of cream on the morning coffee. The snap of cool salt-laden air flooded through the open hatch. Suddenly we were startled by motion directly out our starboard window - a Bald Eagle glided a few feet off our beam and settled gracefully on a rock. He watched us intently as we slipped past toward the towering bridges. "We'll have a great trip in the Northwest," El said, "there's our omen." A shiver of awe and respect rattled down my spine, as I gave our Prophet a salute. -----Years before, setting out on our 2,000-mile through-hike along the Appalachian Trail, a Pileated Woodpecker landed on a tree directly in front of us. These great woodpeckers have long been our favorite. Eyeing us, laden with heavy packs and new boots, she gave her wild call - those ascending/descending "yuk, yuk, yuk" notes we have long associated with the deep woods. She was our omen for a great hike, and it was. ----- As anticipated, Les had done his work well. Halcyon throttled up as we tacked slightly to port, following the confusing passage between Deception Island and Coffin Rock. We had timed our passage to slack water. -----Two hundred and ten years before our journey, Capt. George Vancouver searched this maze of islands, channels, peninsulas, and passages searching for that Holy Grail of 18th Century mariners, the Northwest Passage. He commanded two vessels, Discovery and Chatham, both too large to navigate the maze. Consequently, his explorations were carried out in the ship's cutters, each sent out in different directions and each reporting back on set dates to the large ships, now acting as supply vessels. -----Lt. Joseph Whidbey commanded Discovery's cutter northerly through Skagit Bay. 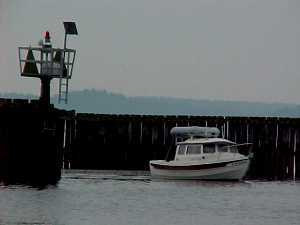 To his port lay what is now called Whidbey Island. The mainland blocked transit to the east. He realized, with mixed emotions I'm certain, that the ebb tide was running northerly beneath his cutter. Since he had entered the Bay about forty miles to the south, through Possession Sound, he reasoned there must be a northerly passage back to the open water. Perhaps the Passage would be wide enough to allow the Discovery and Chatham access to the north. The Bay became increasingly narrow, and rounding the same bend by Cornet Bay we had just navigated, he saw ahead a fearsome sight - all the water of the bay was funneling through a narrow slot 390 feet wide. The tide was in full flood as he witnessed it - whirlpools, overfalls, and churning white water drained out the Pass, sieving between rock-studded islets crowned with a few nonchalant cormorants. 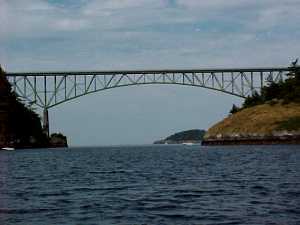 Hearing Whidbey's report, Vancouver gave it the apt name, Deception Pass. -----We had a nice cruise northerly, rounding the red nun #2 off Shannon Point. 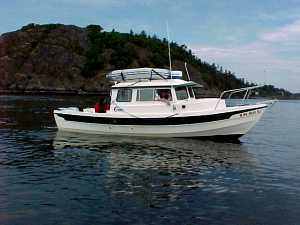 With a following breeze, we slid into Guemes Channel, around Cap Sante, and into the well-marked channel for Anacortes. -----"They're C-Dorys," El shouted with excitement. Coming out the channel were two of the prettiest boats you'd ever want to see. Soon we were circling around each other, like excited puppies. 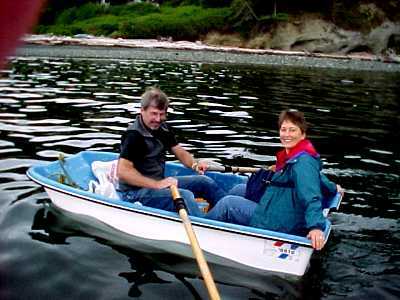 -----Fred Young and Joe and Peg Wall were heading out for the weekend. "Come on along," they coaxed. "Nice weather, maybe a little seafood, good harbor." And, we could tell, good companions. -----We declined, but said we'd think about it at lunch. We tied off at the marina and hoofed up to the Gere-Deli. 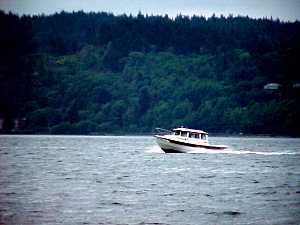 -"Mighty nice cruising grounds, El," I ventured between bites of fresh white halibut. "And the natives are friendly." -----"Right, but for now, it's 'north to Alaska.'" El was sucking on a shrimp tail for a tidbit. "In Washington, we've had the First Nibble."